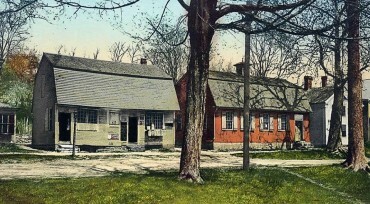 Joseph Carpenter’s silversmith shop is believed to be one of the few surviving silversmith shops in New England. Joseph made clocks, pewter, jewelry and engravings. Today, his work is highly valued by collectors. Joseph shared the shop with his brother Gardner Carpenter, who operated a mercantile business. Today, the building is owned by the Society of the Founders of Norwich and is rented as a law office. The building is in the Colonial/Georgian style. Benjamin Butler was a blacksmith; he was known to be eccentric, witty and most notably, a Loyalist. In 1776, he was arrested and jailed for “defaming the Honorable Continental Congress.” He was forbidden from holding office or raising arms. Butler was said to be indifferent about his sentence and died in 1787. Gardner Carpenter bought the house and built the present red brick house.